The Gentleman Crafter: Tying Up Loose Ends! I totally forgot to take a picture of the spine of Fiona's Lace Mini! Of course there is a story that goes with....LOL! I have a new video camera in hopes that I can capture better video right! Now, who in the dickens has enough time to actually read the 500 page manual that comes with it. I always go for the Fast and Easy setup instructions that come with the gadgets these days! Thank You God! Well, needless to say, I should have taken the manual to bed with me as reading material to learn more about it! Long story shorter...LOL...The last segment of the video from the mini which has the spine piece is exactly 3 minutes! Somehow, and I honestly don't know how in blue blazes I did this, but it taped at an hour and 15 minutes! Like I said it's 3 minutes and when viewed it's 3 minutes but when you go to upload it, Youtube hates it as it shows to be over an hour! Now, I don't like to give up! I really don't, so I guess that means I have to pull out the manual and start from scratch in future. To finish up, you all never saw the spine piece. I have received several emails saying you would like to see it... Well, here it is...Sorry about that you guys! 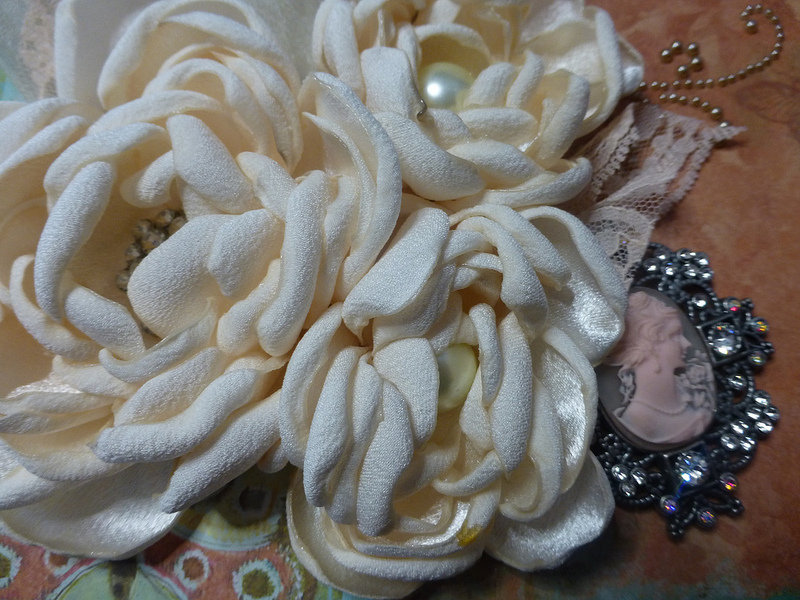 To answer a few more questions, the flowers were made using the melting edge technique. You have seen them done on YouTube a million times. I still love making them! Cut various sized circles from a poly-satin fabric. Cut into the center of the circle about 5 or 6 times forming the petals, chop off the corners of each petal with scissors and then melt the edges with a Bar-B-Q lighter. Stack the layers together and glue each layer to the next with a glue gun. Pop in a button or pearl and done! 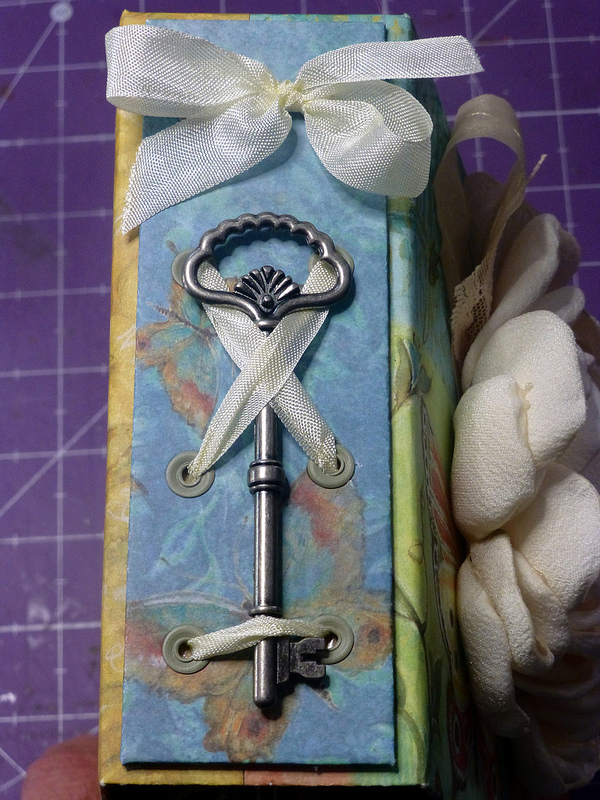 You may recall from my old blog, I think back in Febuary, I did a heart box that opened up sideways to reveal several accordion pockets that held tags. 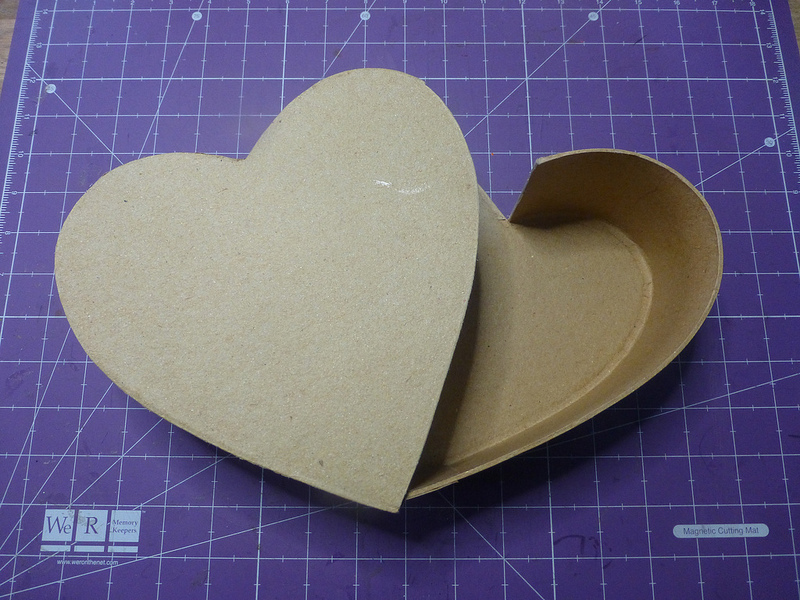 I did this heart box from scratch meaning I made the heart from chipboard. Which was really fun to do... however, I was trying to find a simpler way to make it and low and behold...Ok, don't laugh!....I saw a heart box at Michaels or Hobby Lobby! Can't remember which! See, I told you not to laugh! How many times have I walked past these! LOL! The thing is, like you have read before, my joy comes from trying to figure out how to make my own! But to simplify things, I'm working on another heart box for a wedding present and thought this time, I would write it down! My downfall! I get going and can't stop! Slow down Jimmy boy slow down! So that is one of today's projects I hope to complete soon. I'm off to market tomorrow morning at the crack, so I have to pack things up and get ready to go! See you in Dallas tomorrow! Thanks for posting the spine. I NEEDED to see that. Have a fun, safe trip!!! Will be waiting for your Dallas Blogs!!! Very, very cool!!! Have safe trvels and take lots of pics. Told ya to just buy them....sigh... hee hee Can't wait to see the final project! Gloria, sometimes you are right! LOL! But building things is a ton of fun! You should give it a go my pal! Hugs to ya! I'm thinking you taped it in extreme high def? LOL, don't know :) Have a great trip, always enjoy seeing your projects. What's going on at Market tomorrow that I don't know about? Apparel Mart starts Thursday and we are going up early to finish up fourth quarter merch and order Easter before it sells out from some of the vendors. Thanks! Hope you are having a fun Sunday! I got a wild thought and decided to clean the studio this afternoon! I can't stand it anymore! LOL! Thanks for showing the finished spine to us. It is so pretty! I have never seen these flowers, so I am off to investigate youtube. Have a wonderful time at Market. Looking forward to the pics. What a fun job. I thought your videos were great. Enjoy the new camera. Marcie, Off to make a video real quick for you. Will have it up in about 6 hours! LOL! I have never seen these flowers before, and they are stunning! I thought you bought them. Silly me. Why would I think you would buy flowers when you won't buy pre-made boxes? Thanks for the picture of the spine, it looks great. Will be waiting to see what inspirations comes from Market. Jim, I just got home from camping with the family for 5 days, I love to camp but hate being without the internet for so long, I had withdrawals and had to go into Burger King and check out what was going on in the Scrappy World. Anyway I'm home now and just finished watching your video's. The new camera takes great video, I know what you mean about reading the manuals, I always say I'll wait for the movie. Ha! Beautiful mini, I'm sure Theona loved it, lucky girl!! I loved how you used the washers and the flowers were beautiful! I think your getting a little more comfortable in front of the camera, you don't look as nervous and are doing a great job. I hope you can do the whole u-stream thing soon. Thanks so much for all the work you put into showing us how the project was made. Shari! Oh I love to go camping! It was a favorite pastime of my family! Brings back so many INCREDIBLE memories! Hope you had a blast! I'm trying Shari! You know something, it's people like you who I know I have your support each time I stand in front of that blasted camera! LOL! Truly, I appreciate your support or I'd never have done it! Had to go to Archivers today to get one of those punches. Will be making one of these books tomorrow. Thanks for sharing the spine. Have a safe trip and find lots of cool things. Thanks for the tutorial on Fionas Lace Mini! Very cool technique with that punch. Oh, what can you say about technology. Its great when it works, lol. Looking forward to seeing what you do with the heart box. Have fun at market. Looking forward to the pics. Thanks for showing us that beautiful mini spine and flowers Jim - so pretty! I have made similar flowers with organza type material, but I just used a heat gun - don't think I could be trusted with a BBQ lighter! LOL! Have a safe trip and take lots of photos for us please. The album is so pretty and feminine. I think Fiona will be wild about it. The pages made with the Lucky 8 punch are awesome. Thanks Jim! Your attention to detail really makes your projects spectacular!! Love the key!! Gotta have one for a diary....secret thoughts and all!! Can't wait for what is next! Ave fun in Dallas and safe travels!! Putting the finishing touches on my book today. All the pages are done. Just need to do the spine yet. Love the process. Thanks so much for sharing this gem.